When people talk about wine pairings, I’m often left a bit lost. I mean, I like wine – anyone who knows me or has met me will tell you this. But despite trying wine tasting a few times, sampling wine flights to accompany tasting menus, and even having friends for whom wine pairing is something they do as a matter of course (Catherine and Rob, if you’re reading this, yes this is you), I’ve never quite been able to appreciate what happens when exactly the right wine is put with exactly the right food. No big loss, I know, but I’ve always wanted to ‘get it’. Happily, I can tell you now that in the course of the meal I’m about to describe, I popped my wine pairing cherry, so to speak. It was during this lunch at The Cross that I finally ‘got it’, finally experienced what it’s like when a particular dish put with a particular wine, both great in their own right, together become something wonderful. Alright, alright, stop waxing lyrical and get on with it. I’ve been to The Cross before. Less than half an hour from home in Rugby, it’s not only local for me but it’s bloody good. 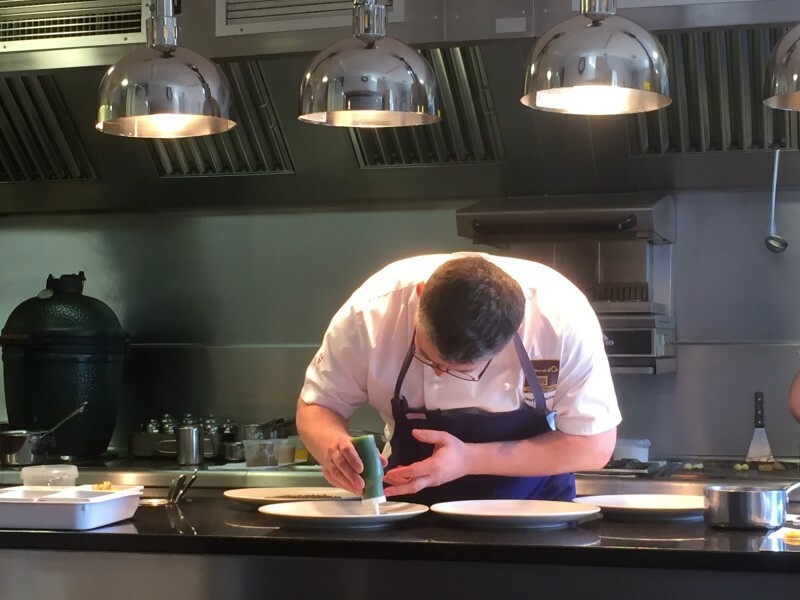 The pub-turned-Michelin-starred-restaurant is owned by Andreas Antona, and has talented Adam Bennett at the helm in the kitchen. It’s a great combination of not being too fussy whilst serving up delicious food. So when I was invited to a lunch that would serve as a bit of a preview for a wine dinner they’re doing, I jumped at the chance. Maison Paul Jaboulet Aine’s vineyards have been around for more than 200 years and are behind some pretty famous wines, not least ‘La Chapelle’. 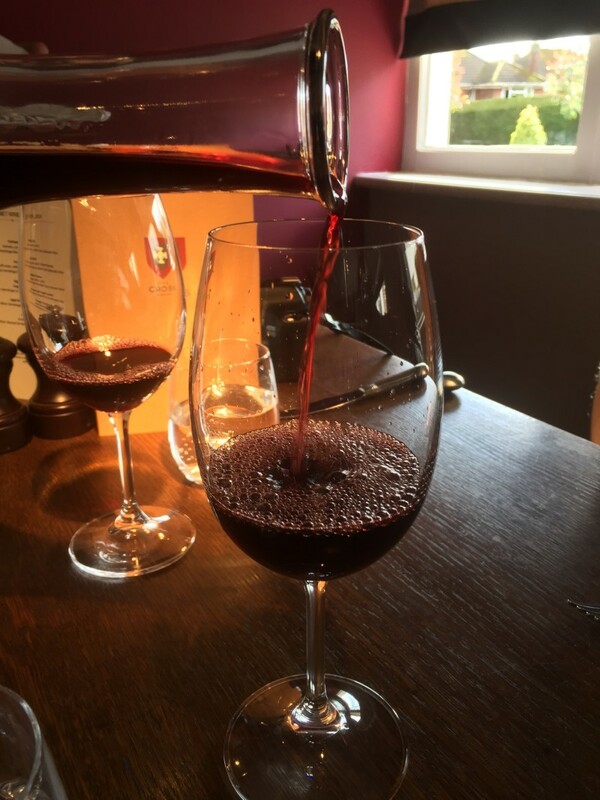 For its wine dinner, the vineyard – bought by the Frey family in 2006 – joined forces with The Cross to pair some of its most famous wines with tailormade dishes by Adam and his team. See, I always had the impression that in most cases a menu is written then a sommelier picks the wines that will go best. But what they did here was pick five great wines, all from the Jaboulet stable, then design courses to match them perfectly. 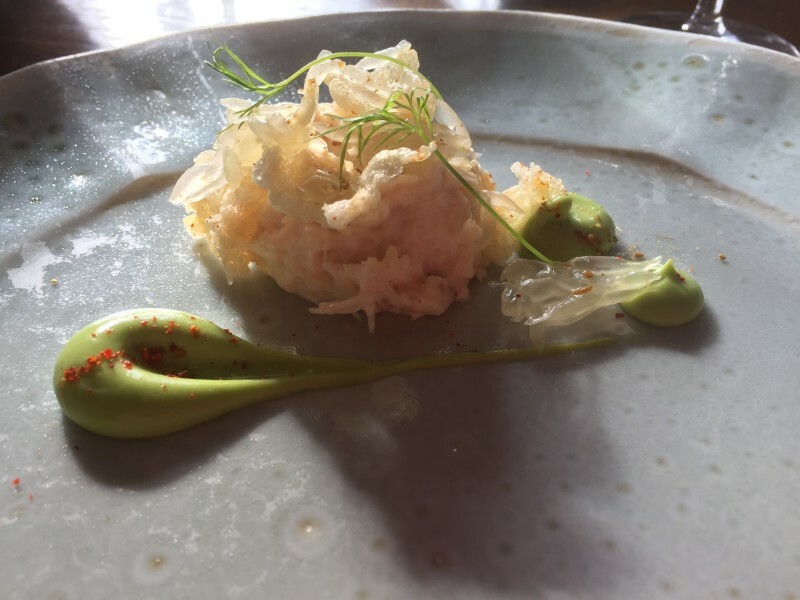 We started with a delicate dish of Portland crab with avocado, pomelo and cumin. The pomelo gave a citrusy freshness to the dish, while the avocado added a splash of colour and rich creamy sweetness. It was served with a glass of Crozes Hermitage Blanc Les Jalets. Seafood and white wine, the perfect summer combination and for me the taste of holidays and seaside. 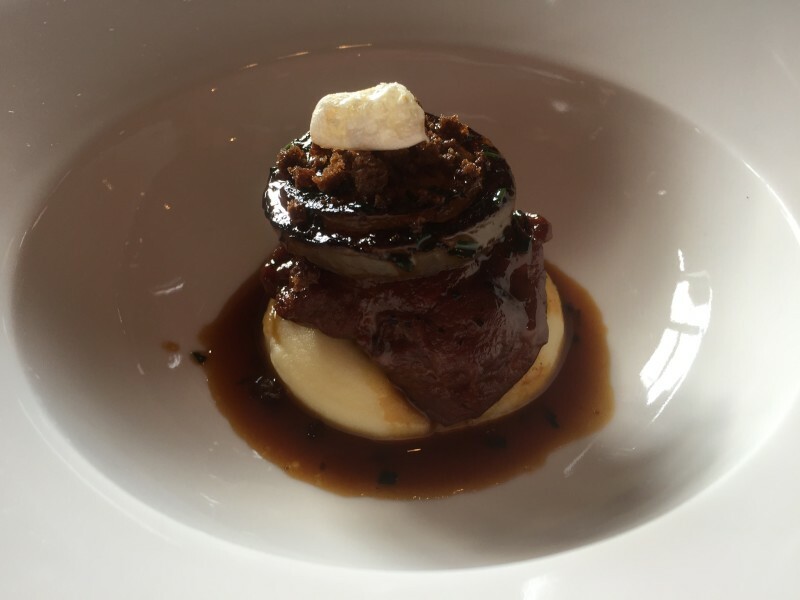 Next up was an artfully-stacked tower of fall-apart slow-cooked pork cheek, roscoff onion (distinctive pink onions from the Breton port of the same name), wild garlic, mash and blood bread, served with Jaboulet’s Crozes Hermitage Rouge Les Jalets. This kind of food is right up my street. Big, bold, deep flavours forming an overall homely and warming dish, yet at the same time allowing different flavours to each sing out in their own voice. The crunchy blood bread on top was my favourite part of the dish, but in truth, it was all fab. The next dish I would definitely have picked if I’d spotted it on a menu. 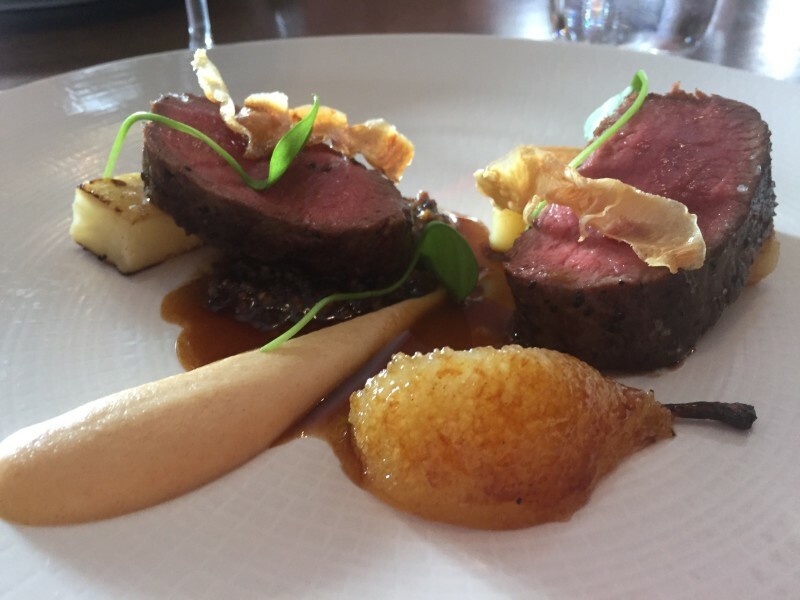 Pink, tender chunks of Highland venison served with soft haggis thinned down with veal stock. The celeriac puree was smooth as smooth can be, the kind of puree you want to smear your finger through to make sure you get every last bit, while the scorched outside of the pear was a lovely combination of soft sweetness encased by a wafer thin layer of caramel crunch. With this course came a glass of Jaboulet’s Hermitage La Petite Chapelle, the ‘little sibling’ of the well-known La Chapelle, packed with peppery flavour that stood up to the venison. La Chapelle was saved to accompany the cheese course of aged Gouda and aged Comte, served with a fig compote and quince jelly. I’m not the biggest fan of harder cheeses, mainly because when I think of aged cheeses I instantly think of gooey, stinky, soft cheeses, but hey, what do I know? 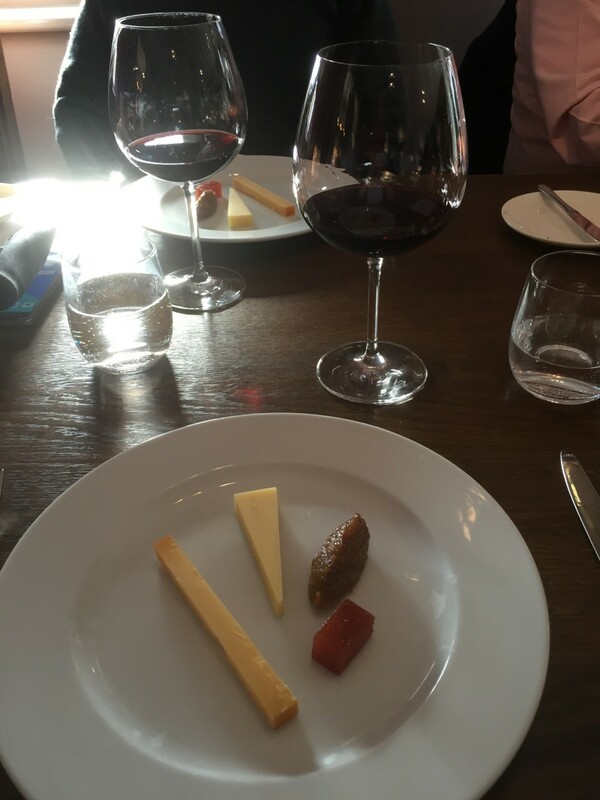 I loved the simplicity of the cheese dish to accompany such a big-name wine though, giving you the chance to actually taste and savour it. A bit of a treat for a simpleton like me! I was feeling pretty smugly happy with myself by this point. Crab, pork cheek, venison, fine wine, great company. Could it get much better? Yes. Because that was when it happened. This, ladies and gents, is the course that brought with it my breakthrough in seeing what wine pairing was all about. I’m not a massive fan of sweeter wines. But from the minute I tasted the Muscat de Beaumes de Venise, I was converted. 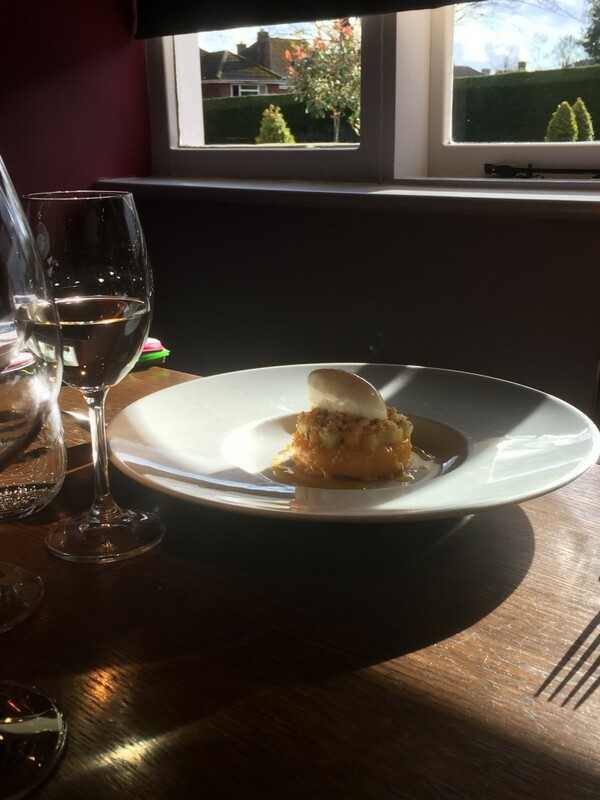 Honey, elderflower, a hint of lychee. These are big words, but I’m not sure I’ve ever enjoyed a glass of wine quite as much. 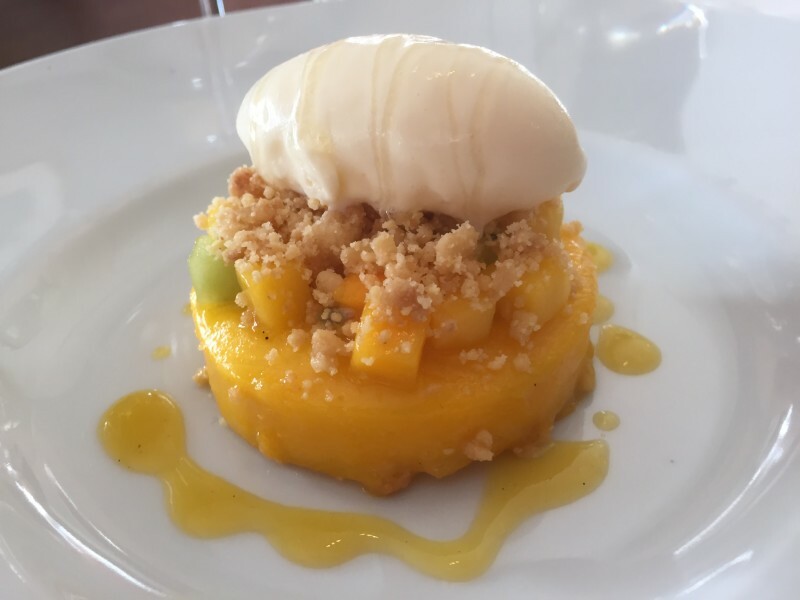 With it, we were served ‘mango crumble’, fresh sweet mango, with crunchy biscuit on top and acacia honey ice cream. Probably not something I’d necessarily order, but absolutely, completely, 100% exactly the right dessert to put with this wine. I wish I could explain it better, but as usual I’m struggling to find the right words. The dessert was great. Colour, texture, taste, brilliant. The wine too was fab, a fruity, light, sweet, complex combination of flavours. But together, they became something even more special. I don’t know how – maybe there’s some kind of science, maybe it’s voodoo, maybe it’s just in my head – but the combination of these two was pure genius. And in that moment, I realised why people rave about wine pairings. Because when it works, it’s a special little moment. And there you have it. Probably one of the best lunches I’ve ever been lucky enough to have, and a real privilege. When I started this blog, I wanted to make sure it included places that anybody could visit, food anyone could cook, and experiences anybody could try. And while I was lucky enough to be part of a small group to try this lunch, the wine dinners at The Cross are something anyone can go to. This one was due to be £100 a ticket so no, it’s not cheap. But then again, it’s five courses of Michelin-starred food, five glasses of some pretty big-name wines, plus hosting from Charlotte Buisson Dackow, Jaboulet’s sommelier, who will talk you through the wines. Slightly more than your average ‘dinner’ out. I’ll leave it up to you. Me, I’m just sitting here dreaming about mangos and Muscat. 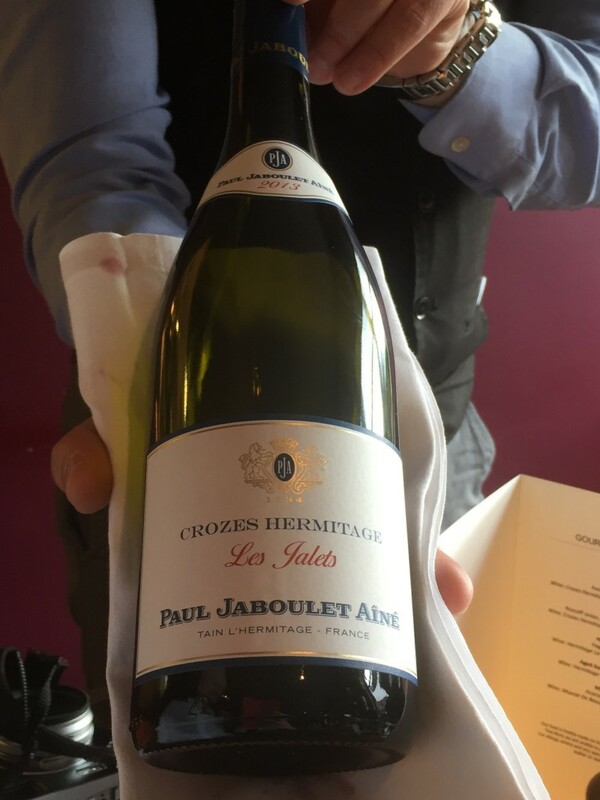 I was invited to The Cross Jaboulet wine lunch as a guest, along with a few other people. I wasn’t asked to write anything positive, it’s just hard not to when it’s this good.